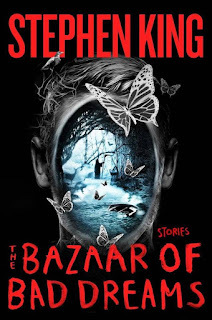 Bazaar of Bad Dreams is Stephen King's sixth short fiction collection. I was a bit disappointed to find that many of those have been already published in various magazines, websites, or released independently. But I guess that comes with the territory. I'm an avid fan of King's work and whenever I see something written by him, I read it. Despite initial disappointment, I was quickly relieved as I found some true gems in there. My favorite has to be Afterlife. It is an interesting vision of what happens with a person after their death. The vision presented here is surprisingly well structured. This perfect organization encountered by the protagonist is contrasted with his confusion and an ending which adds yet another twist. That is just Stephen King at his best. I enjoyed reading the other ones as well. King excels at creating a short, but coherent story, adding credible characters, and wrapping it all nicely with an interesting (not necessarily complicated) story that ends with well placed punch line. Showing people's emotions, ranging from sadness, happiness, anger, to complete madness, is another of King's strengths. It's nice to find that he still manages to do that so well.